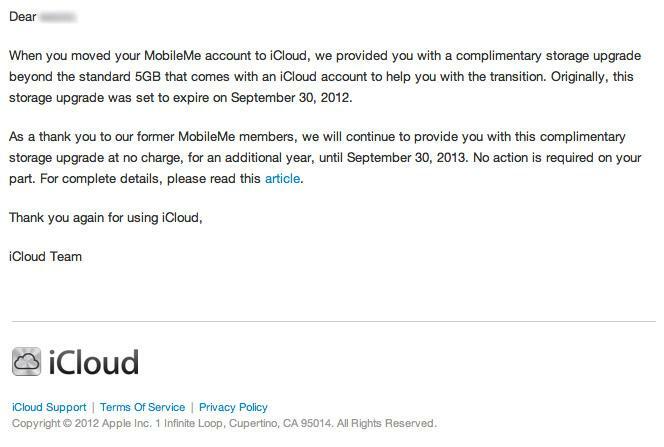 Apple on Friday sent out emails to former MobileMe members, informing them that their previous subscription-based allotment of storage will continue until September 30, 2013. The company also created a support page describing the reasoning behind the extension, and explaining how much storage each former MobileMe subscriber will be allotted. The extension will reflect whatever storage tier former MobileMe members subscribed to before switching to iCloud, meaning that for the next year users will be given a complimentary 10GB, 20GB or 50GB of storage on top of the 5GB of free space offered with iCloud. Apple notes that any iCloud upgrades purchased going forward will replace the complimentary storage plan, meaning the cancellation of said upgrade will bump users back down to the standard 5GB of free storage, not the amount reflected in the complimentary extension. Initially offered to paying MobileMe customers during the transition to iCloud, the initial extension was meant to allow subscribers of the erstwhile service enough time to transfer documents off the cloud, as well as to acclimate those users to the smaller storage limit. Currently, iCloud offers users 5GB of free space to sync device data, music and other files to Apple's servers. Apple originally scheduled the extended MobileMe storage offer to end on Sept. 30, 2012, though when that day arrived last week, what was thought to be a glitch in the system allotted 25GB of free storage to both iCloud and MobileMe members until the year 2050.